This painting was the key work in Tyndall's 1995 exhibition 'The Big Bang (and five more last words)'. It effectively embodies the concerns of his practice from the late 1980s, when he extended his consideration of the circulation of the art object and the viewer's relation to it, to a consideration of creativity (and creation myths). Tyndall took his ideogram of LOGOS/HAHA - the power embodied in the word (LOGOS) undermined by the simple response of laughter (HAHA) - which he had used to symbolise the power relations involved in looking at a work of art in an art gallery, and applied it to Christian creation. The seriousness, the absolute solemnity of the word as calling into creation is set up against its antithesis, the word as laughter, a hilarious moment, a chortle which takes apart the gravitas of the word as creator. The split in this mythology of mastery and creation is the same split that Tyndall has used as leverage in his distilled exploration of how we encounter art. Tyndall's Catholic upbringing has been of bearing on these works. 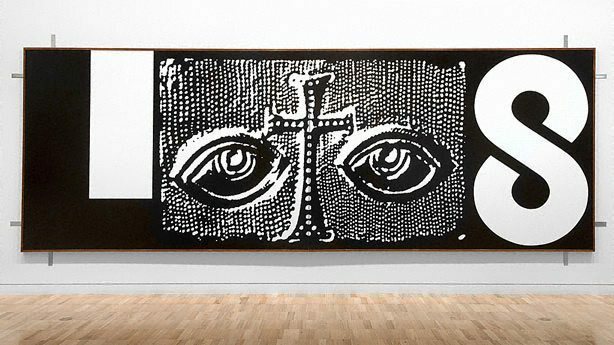 The painting is a divided canvas depicting the word logos, with the L and the S as letters and the O and G replaced with two eyes and a crucifix. Logos, the essence of Christian creation, is split in two by the divided canvas that also splits the crucifix. The image of the archaic crucifix and the eyes on either side derive from amulet that was placed in St Peter's tomb in the time of Constantine. The eyes have a defensive and almost pagan role, perhaps warding off the 'evil eye' by getting in first with their staring look. Tyndall has used this powerful image "to anthropomorphise the word LOGOS" (quoted in Ashley Crawford, 'detail: a person looks at Peter Tyndall', 'Tension 18'). The word of God and the eye of God combine as an expression of power. Tyndall has written of this exhibition 'The Big Bang' in this case being the (first) sound (in the beginning was the word...) of the First Word being broken, being evoked, being made, (as represented by the split between the two LOGOS halves in my archetypal foundation myth imagery). In my thinking and planning this BIG painting belongs as the generic generator back in 1988. It's just that I had not gotten around to doing it before this." Wayne Tunnicliffe, Contemporary: Art Gallery of New South Wales Contemporary Collection , 'Cultural memory, critical distance', pg.154-203, Sydney, 2006, 156, 200, 201 (colour illus.). Linda Michael, Word , Sydney, 1999, 3, (colour illus.). Peter Tyndall, The Big Bang (and five more last words) , Melbourne, 1995, cover (illus. ).